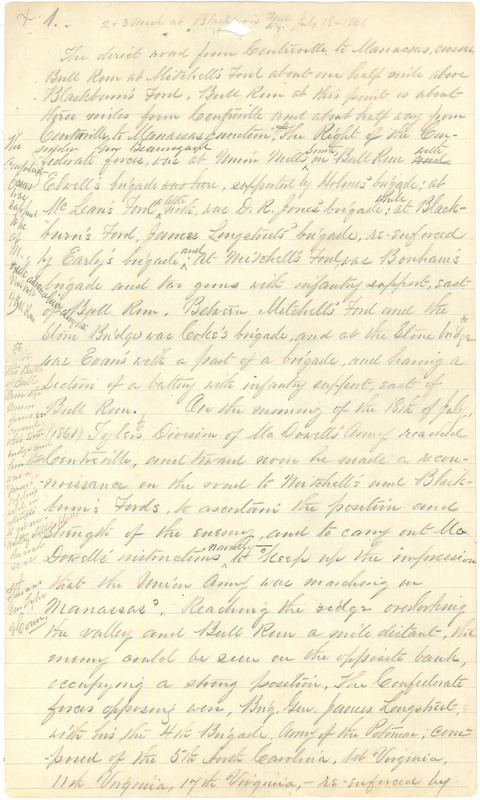 DIY History | Transcribe | Civil War Diaries and Letters | Account of the Battle of Bull Run, 1861 | 1861-Battle of Bull Run-Page 31. 1861-Battle of Bull Run-Page 31. + 1 2 & 3 Mich at Blackburns Ford July 18- 1861 The direct road from Centreville to Manassas, crosses Bull Run at Mitchell's Ford about one half mile above Blackburn's Ford. Bull Run at this point is about three miles from Centreville and about half way from Centreville to Manassas Junction. # The Right of the Confederate forces under Gen Beauregard was at Union Mills Smith, on Bull Run with Elwell's brigade, supported by Holmes' brigade; at McLean's Ford a little north, was D.R. Jones' brigade; while at Blackburn's Ford, James Longstreet's brigade, re-enforced by Early's brigade and at Mitchell's Ford, was Bonham's brigade and two guns with infantry support, east of Bull Run. Between Mitchell's Ford and the Stone Bridge was Coke's brigade, and at the Stone bridge * was Evans' with a part of a brigade, and having a Section of a battery with infantry support, east of Bull Run. On the morning of the 18th of July, (1861) Tyler's # Division of McDowell's Army reached Centreville, and toward noon he made a reconnaissance on the road to Mitchell's and Blackburn's Fords, to ascertain the position and strength of the enemy, and to carry out McDowell's instructions, namely - to o keep up the impression that the Union Army was marching on Manassas.o Reaching the ridge overlooking the valley and Bull Run a mile distant, the enemy could be seen on the opposite bank, occupying a strong position. The Confederate forces opposing were, Brig. Gen. James Longstreet, with his, the 4th Brigade, Army of the Potomac, composed of the 5th North Carolina, 1st Virginia, 11th Virginia, 17th Virginia, - re-enforced by [Additional notes in left margin:] o The Confederate forces were supposed to be at M. [and?] advance line along the west bank of Bull Run After the Battle of Bull Run the main forces re-crossed this Stone bridge and here there was a "panic" - soldiers [wild?] in attempts to get over - artillery stopped [illegible?] the road &c &c This was Gen Tyler of Conn.